I've just updated the page describing Kinase inhibitors, added more on fragments and selectivity. With over 500 proteins encoded in the human genome it is perhaps not surprising that among enzyme inhibitors, Kinase inhibitors are an increasingly important therapeutic category. 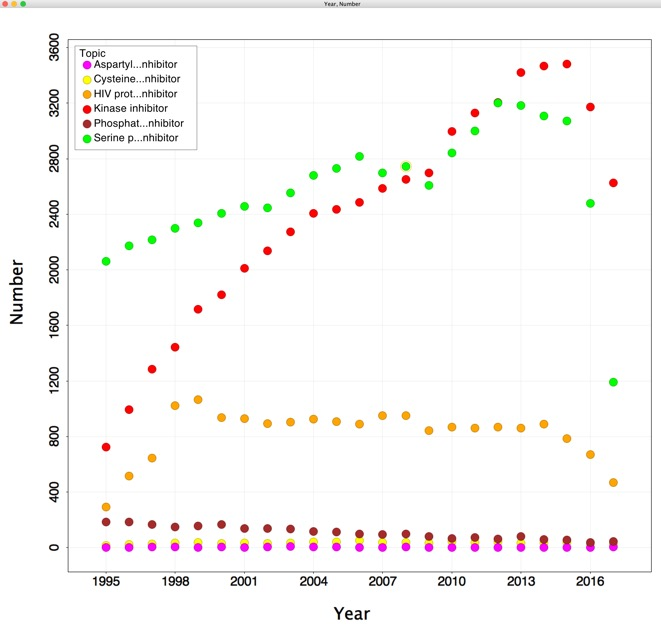 The plot below the number of results returned for various string searches of PubMed versus year. Whilst "serine protease inhibitors' (grey) was the highest scoring in 1995 over the intervening years "kinase inhibitors" (red) has risen and is now the highest scoring search string. To this end, we used a chemical proteomic approach (kinobeads) and quantitative mass spectrometry to characterize the target space of 243 clinical KIs that are approved drugs or have been tested in humans…..The number of targets for a given drug differed substantially. Whereas some compounds showed exquisite selectivity, others targeted more than 100 kinases simultaneously, making it difficult to attribute their biological effects to any particular mode of action. All drug profiles can be interactively explored in ProteomicsDB and a purpose-built shinyApp.